Well, I got to use the new word I learned last week. On Sunday after the MOA rally in Salem, I headed up to Portland to pick up a couple of pieces of luggage that we left between the trip from Singapore and back home to Fairbanks. 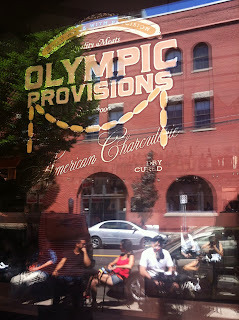 I went with a relative to Olympic Provisions, a gourmet charcuterie in Portland. They make all of the cured meat products for their restaurant as well as for other specialty markets in the Pacific Northwest. 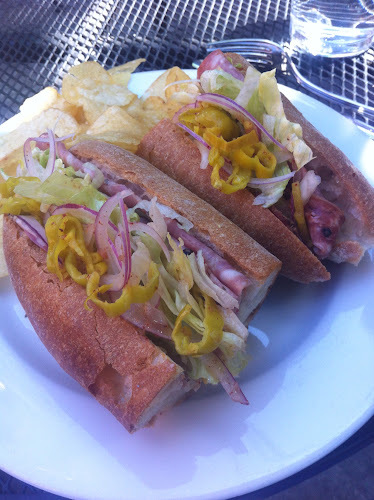 I had the capicola and cotto salami hogie on a nice hard crusted roll and it was delicious. We had lunch outside on the sidewalk in front of their store with temperatures around 75°F. After the wonderful lunch, I headed south to Corvallis. I got in a little geocaching and spent quite of bit of time on an audio conference with folks in Fairbanks. On Tuesday evening, I had the opportunity to have a wonderful dinner with fellow moto-bloggers Troubadour and Trobairitz at the Big RIver Restaurant in Corvallis. Before we knew it, several hours had passed. As always, it was great to visit with them again and share a meal. No pictures as I didn't think of it. That sandwich looks formidable! You're not in Japan anymore! I'm glad I shared my new word. Sounds like you had a really good visit. Isn't "letterboxing" the same as geocaching? Except that geocaching is done with a gps. Letterboxing uses old orienteering skills as in map and compass. But exactly the same idea of hiding something somewhere and publishing coordinates and hints. A lot of geocaches are tiny (as in nano caches) about the size of a pencil eraser with a magnet on the end. They are frequently stuck to the back of signs. I like the letterboxing idea more. Maybe more romantic, old fashioned. And the contents of the boxes can be so wonderful! Like a treasure chest. Corvallis is a wonderful town, as are many college towns around the U.S. I think that I would have difficulty living somewhere without a university as they seem to have a major impact on the nature or feel of the town. It was great to see you again Richard - as always. It was nice to sit and visit for a few hours. And thanks for the Moosetard too. I like to keep a few different kinds on hand and these will be so tasty. I am glad you found Anderson's. They have about the best blueberries around. So how many blueberries did you eat while picking? It is a kind of prerequisite for u-pick I think. 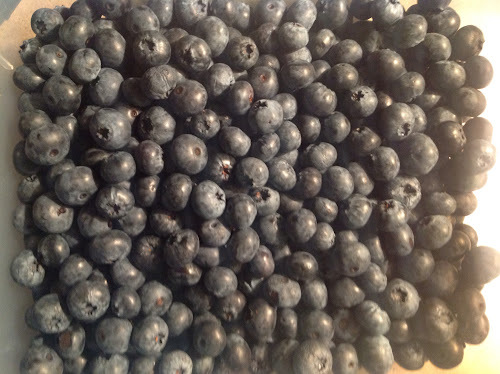 I think they charge and extra $0.25 per pound just to compensate for the eat as you pick blueberries. It was great to see you and Brad again. And thank you for the Anderson's recommendation. It turns out that I had been there before around ten years ago but didn't remember the name or the location. Only one handful consumed before. That's my story and I'm sticking to it. That is one good looking sandwich! It tasted even better than it looked! Their cured meat products are sold all over town, I'm told. You have a killer schedule and I'm glad that you made the time for a visit. I'm sure there will be other opportunities. And hope you like the Moosetard.